An inflammatory nodule of sclera is mostly due to immunological phenomena. 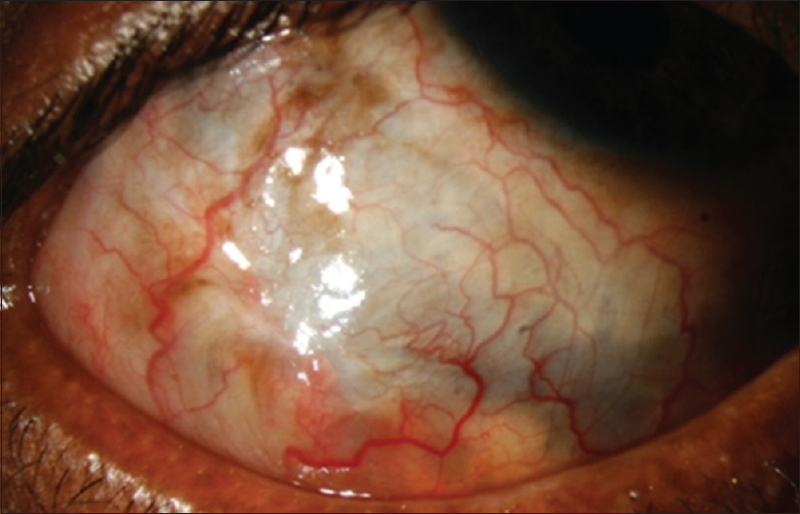 Whereas systemic collagen vascular diseases are associated with 40%–50% patients with scleral nodular infiltrates, infectious scleritis is a rare entity accounting for only 5%–10% of all cases. Although it is very important to differentiate between two conditions from management point of view, it is often challenging to diagnose the etiology as the clinical pictures of two conditions often masquerade with each other. Initial features of infectious scleritis may look like immune-mediated scleritis and often result in an undue delay in the diagnosis. Infectious scleritis usually follow accidental or surgical trauma, severe intraocular infection, or may occur as an extension of a primary corneal infection. Infectious scleritis is mostly due to bacterial pathology and Pseudomonas aeruginosa are most commonly reported., Unusual organisms such as Nocardia, Acanthamoeba, atypical mycobacteria, Mycobacterium tuberculosis, Listeria monocytogenes, and fungus are also known to cause scleritis. A single case of spontaneous P. aeruginosa scleritis was also reported.Proteus sp. as a causative organism of infectious scleritis is extremely unusual. Hemady et al. reported one single case by Proteus mirabilis in a 70-year-old male patient after strabismus surgery. To the best our knowledge, this is the second case of scleral abscess due to Proteus sp. reported which was endogenous in origin. A 48-year-old gentleman presented with severe pain, watering, and decreased visual acuity in the right eye for 7 days. He was on oral prednisolone 60 mg daily and topical therapy (prednisolone acetate 1% 4 times a day and moxifloxacin 0.3% 6 times a day) by the previous physician, but the condition worsened over the next 7 days. He had no history of trauma, surgery, ocular ailments, or any other infective foci including urinary tract infection or history of intravenous drug addiction. He had mild fatty liver as systemic illness. His blood reports and serology profile were normal. Slit-lamp examination of the right eye found multiple small scleral nodule, with one large (6 mm × 4 mm) nodule with pus point in inferotemporal quadrant [Figure 1]. Cornea was clear and anterior chamber suggestive of uveitis (cells 3+, flare 3+) with best-corrected visual acuity (BCVA) of 20/60. Aspiration of nodule and deroofing was done under local anesthesia [Figure 2]. Scraped materials were sent for smear and stained with potassium hydroxide and Gram stain which did not reveal any organism, except only few inflammatory cells. Initial therapy was started empirically with topical antibiotic (mostly gatifloxacin 0.3% and ciprofloxacin 0.3%, and natamycin 5% all 4 times) along with systemic ciprofloxacin (500 mg) twice daily. The exudates were cultured on blood agar, chocolate agar, and Sabouraud dextrose agar (SDA). All media were incubated at 37°C except SDA, which was incubated at 27°C. After 5 days, culture on blood agar showed growth of P. mirabilis. 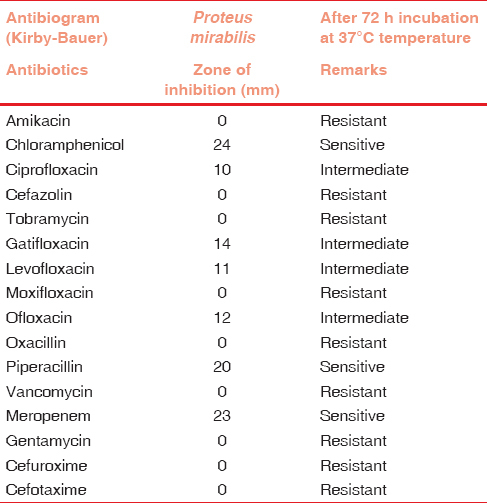 Antibiotic susceptibility done by Kirby–Bauer disc diffusion method [Table 1] revealed that the organism is highly sensitive to chloramphenicol, meropenem, and piperacillin and moderately sensitive to ciprofloxacin, gatifloxacin, levofloxacin, and ofloxacin. The treatment was modified according to the sensitivity report with topical chloramphenicol 6 times daily, gatifloxacin (0.3%) 4 times daily, and systemic piperacillin injection 2 g 2 times/day for 7 days (by medical internist). Oral ciprofloxacin 750 mg twice a day along with topical chloramphenicol and gatifloxacin 4 times continued for 3 weeks and healing with scarring started. He was continued with the same therapy with complete resolution in next 7 days [Figure 3]. His BCVA improved to 20/40 with no posterior segment complications. In the last 2 weeks, a local inflammatory conjunctival granuloma appeared which was managed successfully with local topical steroid short course under cover of the antibiotics. Etiologies of scleritis range from idiopathic, autoimmune to infectious results with variable disease severity and outcome. Infection is a rare but important cause of scleritis, occurring in about 5%–10% of all cases. The inciting factors of infectious scleritis are mostly surgical. Infectious scleritis after pterygium surgery, excisions of conjunctival neoplasms, cataract surgery, vitreoretinal surgeries, and glaucoma surgeries have been reported. In pterygium surgery, use of concomitant radiation or mitomycin C is also considered as a risk factor as reported by Hodson et al. Self-inoculation of infective organism from a distant site on the body or trauma is also a significant risk factor. Immunosuppression either due to human immunodeficiency virus or chemotherapy spontaneously causes infectious scleritis. Meyer et al. reported an interesting single case of spontaneous infectious scleritis due to P. aeruginosa resistant to fourth-generation fluoroquinolones without prior inciting history, necessitating the importance of considering infectious etiologies despite the lack of leading history. P. mirabilis is a Gram-negative, rod-shaped bacterium and can be found as part of the microflora in the human intestine. P. mirabilis accounts for most of the urinary tract infections in hospital settings. It is found as a free-living microbe in soil and water. The organism in this case was completely resistant to cephalosporin and aminoglycosides, mostly sensitive only to chloramphenicol, piperacillin, and meropenem (highest), and intermediately to ciprofloxacin, gatifloxacin, levofloxacin, and ofloxacin. Reśliński A et al. reported Proteus isolates of multidrug-resistance to penicillin and cephalosporins, 98.9% to co-trimoxazole, 77.7% to quinolones, 63.8% to tetracyclines, 38.5% to aminoglycosides, 19.3% to monobactams and 3.4% to carbapenems. We treated him systemically with piperacillin–tazobactam injection, oral ciprofloxacin (750 mg BD), and gatifloxacin and chloramphenicol as topical drops. The patient had no compliant to piperacillin drops. Infectious scleral abscesses are very difficult to eradicate because of poor antimicrobial penetration into the avascular necrotic sclera. Complete healing of the lesion took 7 weeks with mild uveal show which is covered with conjunctiva. Infectious scleritis takes longer resolution time as compared to noninfectious scleritis. In a study, Hodson et al. also reported the median time between commencing treatment, and resolution of scleritis was 46 days. Due to the similarity of its presentation, infectious scleritis is often initially managed as autoimmune, with immunosuppressant that may worsen the outcome and cause diagnostic delay, and the aggressive nature of the associated microbes further complicates the situation. Appropriate diagnosis generally includes scleral scrapings with thorough culturing and antibiotic sensitivity testing. Both aggressive medical and surgical methods are needed to save the globe from loss. In addition to microbe-specific medical therapy, repeat drainage and debridement of scleral abscesses and necrotic tissue with the use of various tissue grafts for scleral reinforcement are necessary for resolution. Antimicrobial agents, timely surgical intervention, and judicious and prudent anti-inflammatory treatment in case of the inflammatory complications may lead to better outcomes. 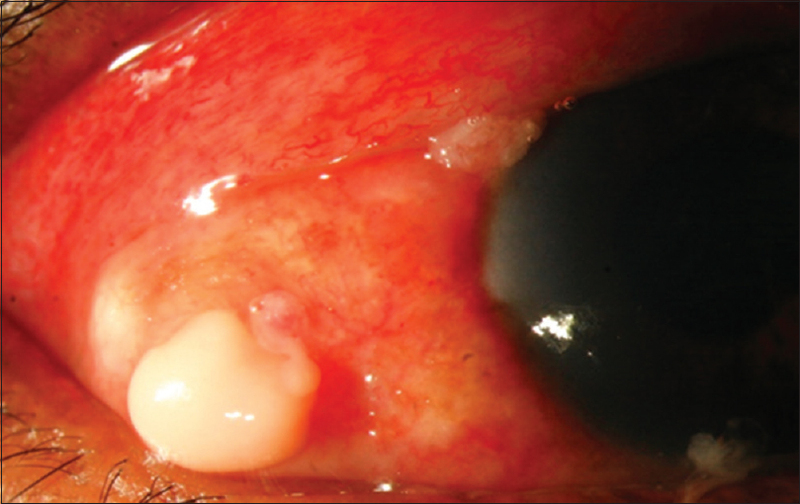 This case report strengthens the need for high clinical suspicion and nodule exploration with a microbiological workup for a case of worsening nodular scleritis despite conventional immunosuppressive treatment. Jabs DA, Mudun A, Dunn JP, Marsh MJ. Episcleritis and scleritis: Clinical features and treatment results. Am J Ophthalmol 2000;130:469-76. Okhravi N, Odufuwa B, McCluskey P, Lightman S. Scleritis. Surv Ophthalmol 2005;50:351-63. Foster CS, Sainz de la Maza M. The Sclera: Infections Scleritis. New York: Springer-Verlag; 1994. p. 242-77. Lin CP, Shih MH, Tsai MC. Clinical experiences of infectious scleral ulceration: A complication of pterygium operation. Br J Ophthalmol 1997;81:980-3. Hsiao CH, Chen JJ, Huang SC, Ma HK, Chen PY, Tsai RJ. 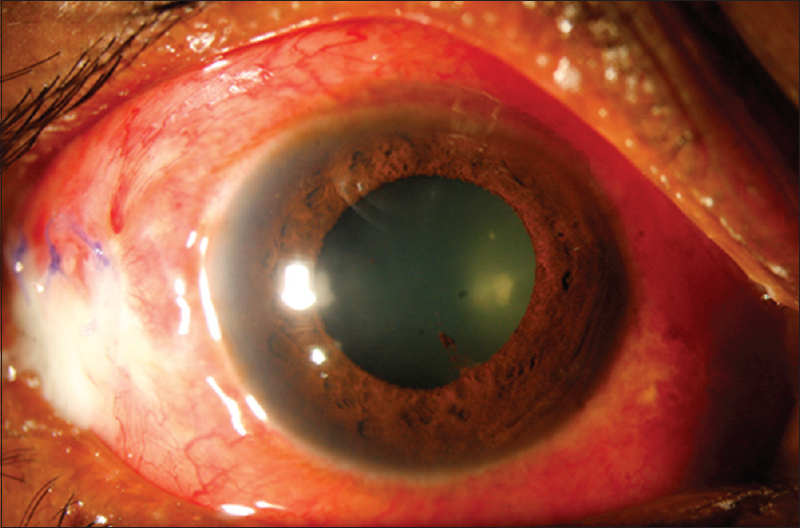 Intrascleral dissemination of infectious scleritis following pterygium excision. Br J Ophthalmol 1998;82:29-34. Oz O, Lee DH, Smetana SM, Akduman L. A case of infected scleral buckle with Mycobacterium chelonae associated with chronic intraocular inflammation. Ocul Immunol Inflamm 2004;12:65-7. Meyer JJ, Espandar L, Marx DP, Vitale A, Moshirfar M. Pseudomonas scleritis resistant to fourth-generation fluoroquinolones in a patient without prior trauma or surgery. Ocul Immunol Inflamm 2008;16:127-9. Hemady R, Sainz de la Maza M, Raizman MB, Foster CS. Six cases of scleritis associated with systemic infection. Am J Ophthalmol 1992;114:55-62. Jain V, Garg P, Sharma S. Microbial scleritis-experience from a developing country. Eye (Lond) 2009;23:255-61. Hodson KL, Galor A, Karp CL, Davis JL, Albini TA, Perez VL, et al. Epidemiology and visual outcomes in patients with infectious scleritis. Cornea 2013;32:466-72. Maskin SL. Infectious scleritis after a diabetic foot ulcer. Am J Ophthalmol 1993;115:254-5. Reśliński A, Gospodarek E, Mikucka A. Prevalence of multidrug-resistant Proteus spp. strains in clinical specimens and their susceptibility to antibiotics. Med Dosw Mikrobiol 2005;57:175-84.